The Walking Dead: Season 7, Episode 13 "Bury Me Here" Review – AiPT! After last week’s disaster of an episode, The Walking Dead returned this weekend with a show featured two of its most interesting/infuriating characters: Carol and Morgan. The episode opens with Ezekiel and The Saviors loading a single cantaloupe into their truck…which seemed pretty odd at the time. After the credits, we see Carol waking up from a nightmare. Whatever she dreamt about (my bet is on flowers and cookies coming to life and trying to kill her) inspires her to make a trip into The Kingdom. After nonchalantly dispatching a group of walkers, she walks in and demands to know why Jesus brought Rick and Co. in for a meeting. Clearly she realizes that Daryl didn’t tell her everything and that something is up. To Ezekiel’s credit, he totally shuts Carol down, reminding her that she was the one who wanted to go full on hermit and shut out the rest of the world. As she stormed back out of The Kingdom, Benjamin runs up to Carol and totally fanboys out, begging her to teach him how to fight like she does. Carol wisely turns him down. Later, Benjamin visits Morgan (DEAD MAN WALKING) and gives him a painting as a gift (DEAD MAN WALKING). Morgan is clearly touched by the gesture (DEAD MAN WALKING). Meanwhile, Richard ventures outside The Kingdom to dig a grave, which he tosses his daughter’s old book bag into. Later, he approaches Morgan and apologizes for being such a jerk lately—which he completely negates by immediately reminding Morgan that he will have to kill again some day. We all know it’s going to happen, but there was no reason for Richard to be such a douche about it. There’s also a funny scene with Ezekiel and his tiger scaring the crap out of one of his subjects, but there wasn’t much to it beyond making me look up what a weevil is. On their way to the supply exchange with The Saviors, Ezekiel and his usual exchange crew come across a roadblock made of shopping carts. I’m not sure why this vexed them so much—anyone who’s been to Walmart has had to navigate around much worse. Regardless, they overcome the obstacle only to find Richard’s grave adorned with a sign that says ‘BURY ME HERE.’ Richard silently looks on and allows them all to talk about what type of messed up person would do something like that (FORESHADOWING). When they finally arrive late to the drop, Gavin and his Savior crew are annoyed to discover that there are 11 cantaloupes instead of 12. Gavin responds to this egregious mistake by forcing Ezekiel and his people to hand over all their guns. He then explains that someone has to die as punishment, allowing Jared (the exceptionally mean one who looks like Kid Rock) to pick who gets killed. Ezekiel begs Gavin to let them come back with double their tribute, but Gavin won’t hear of it. He’s a Savior gosh darn it, which means he has to be evil to the point of inefficient totalitarianism so that the audience is sure to hate them. Jared aims his gun at Richard, who steps forward to take his punishment. Jared smiles, then shifts his gun over and fires at Benjamin. After Gavin makes sure they know to return tomorrow with ONLY ONE CANTALOUPE, Ezekiel and Co. race to Carol’s to see if they can save Benjamin. As the poor boy bleeds out on her table, he tells looks up into Morgan’s eyes and reminds him “that to injure your opponent is to injure yourself” and promptly dies. Morgan storms outside, returns to the site of the random empty grave they found, and completely loses it. He flashes back to his “clear” phase along with a greatest hits slideshow of his worst moments since the zombie apocalypse began. Then he starts hearing voices and attempting to slit his wrist. Just when it doesn’t look like Morgan’s mind can snap any further, he kicks a random nearby container (always a convenient prop on The Walking Dead set), which just so happened to be hiding the cantaloupe that Richard took from their supply exchange. Let’s stop the tape right here for a second. I get what Richard was doing. It’s the same false flag crap he’s been doing since becoming convinced that Ezekiel needed to be pissed off so he’d go to war with The Saviors. But why keep the cantaloupe somewhere it could be found? It’s a piece of fruit—and a terrible one, at that. They also had plenty more back at The Kingdom. Richard could have just chucked it into the woods or stuck it on a walker’s head or something. Instead, he put it somewhere that would easily implicate him as the reason for what he assumed would be his own death—and thus potentially negate his sacrifice. Morgan storms back to The Kingdom, barges into Richard’s room, and throws the missing cantaloupe down in front of hm. Richard responds by admitting that it was him who put everything into motion, but that he’d done it thinking that Jared would kill him, not Benjamin. He then went on to justify the sacrifice as something they could still use to make sure Ezekiel did the right thing—and to make The Saviors believe that The Kingdom understood what was expected of them—all while Morgan glared at him with the same look I give my students when they tell me they forgot to turn in an assignment they’ve had for four weeks. At the next day’s drop, Morgan breaks his vow of silent rage to ask if Richard has told Ezekiel what he did like he promised he would. Richard says he hasn’t yet, but totally will soon. When The Saviors show up, Gavin learns that Benjamin is dead (because gunshot wounds in a world without modern medicine tend to be fatal) and actually seems…sad. I’m not sure how to feel about that that, honestly. On one hand, it’s nice to see a Savior have another emotion besides sneering malice along with a small shred of humanity. But he clearly wasn’t going to be sad if Richard died. I know we all hate Richard, but it seems odd that Gavin’s sympathy is given more freely to someone just because they’re younger. But I digress…Gavin yells at Jared to walk back home or be killed (which was awesome). Then Richard attempts to present Gavin with the cantaloupe only to get jumped by Morgan, who goes full on psychotic and kills him (!). Yep. Abraham and Glenn dying was rough, but seeing his bo staff student for the last few months get killed was a bridge too far. As the two groups look on in shocked bewilderment (no one tried to stop them? ), Morgan shakily reveals Richard’s plan while also enacting it, explaining that The Kingdom “gets it” as far as what is expected of them now. He also accidentally refers to Benjamin as Dwyane (the name of his late son) and looked like he could explode at any minute, which freaked everyone out—myself included. After burying Richard, freaking out some more, and hacking away at some walkers, Morgan goes to Carol and hits her with the news that Abraham and Glenn were killed. He then storms off and declares that he is going to kill all The Saviors himself (ugh). 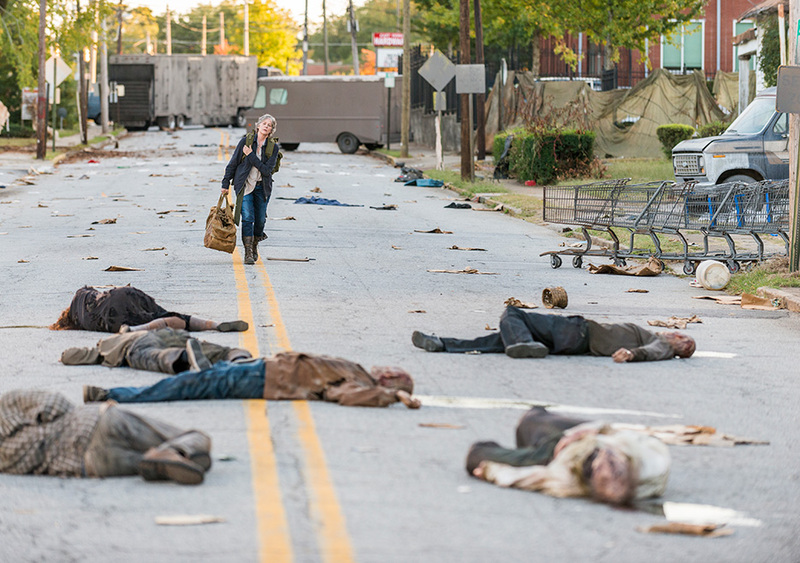 Carol responds by moving from her hermit shack into the Kingdom, where she informs Ezekiel that they need to start preparing for war. Morgan was forced to kill again. Carol learned about Abraham and Glenn and is ready to kill again. Richard’s plan to get Ezekiel to go to war had unintended consequences. Unless you’re the type of person who thinks The Big Bang Theory is a good show, then you probably saw all of these things coming from a mile away. Where I have to give the episode a lot of credit, however, is in its execution (pun not intended, but I’m keeping it in). Those stand-off scenes between The Kingdom and The Saviors were all types of tense—and for once, a member of The Saviors showed a shred of humanity, which is part of why they were such a more interesting group in the comics. Also, Richard had to die after trying to kill Carol. Having him murdered by Morgan of all people was a little out of left field, but the shock—and how well Morgan sold it—made the moment work. Speaking of Morgan, the bulk of this episode’s quality falls squarely on the shoulders of Lennie James. Good lord, I really hope someone at the Emmys was watching this. It’s easy to forget how unhinged his character used to be back in Season 3, but James took us from calm/collected Morgan to psychotic/enraged Morgan in one of the most powerful performances we’ve ever seen on the show. He also had that great silent scene where Richard babbles and tries to justify his actions. Morgan’s responsive stare said more than words could ever hope to express. As we’ve come to expect this season, the characters made some incredibly stupid decisions to help the plot along (Richard not disposing of the cantaloupe, Gavin being sad about a death he could have easily kept from happening, Morgan going off on his own to kill The Saviors, etc. ), but James’ performance was almost to overshadow those things completely. And whether you like how we got here or not, we’re FINALLY back to Carol and Morgan not being doggedly (and ridiculously) pacifist anymore. Let the war begin. The Walking Dead: Season 7, Episode 13 "Bury Me Here"
A tour de force performance by Lennie James as Morgan saves an otherwise predictable/contrived episode. Lennie James deserves an Emmy. The stand-off scenes between The Saviors and The Kingdom were all types of tense. Whether you like how we got here or not, Carol and Morgan are finally over that stupid "no killing" phase they both went through. Lots of stupid decisions made by the characters to help the plot along. Aside from Morgan killing Richard, every big reveal in this episode was something we knew was going to be happening very soon.